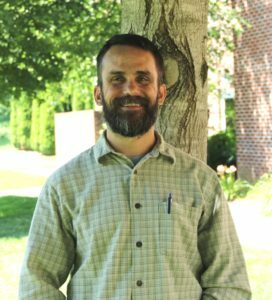 My name is Ben Floyd and I and my family arrived at Blackburn’s Chapel in July 2017 after spending the last three years studying for my ​M.Div at Candler School of Theology in Atlanta, GA. While answering God’s call is never an easy proposition, we have felt nothing but warmth and love since arriving here in Todd! I have served as a pastor in Asheville and north Georgia during my time in seminary. My first year of service was helping to begin a recovery ministry at Central UMC in Asheville. We then moved to Atlanta for the last two years of school, serving as a pastor at a small church as well as a pastoral intern at a newer, vibrant church plant. I find myself drawn to ministry that reflects the context and needs of particular communities while at the same time learning from the early Church about the traditions and doctrines that form the eternal basis for our faith in Christ as Savior. I have been married for 12 wonderful years to Amy, who has followed along this unknown path in ministry with a grace and understanding that knows no bounds. We have two children, Grace and Sam, who constantly teach us about what it means to be faithful parents and models of the Gospel at home and in the world around us. We are looking forward to continued service to the people in and around Todd!